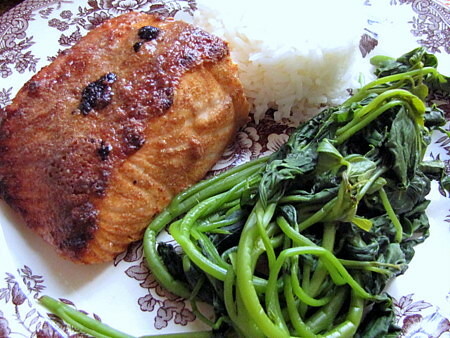 Food Friday: Sinigang Mix Crusted Salmon ~ I Can Do That! 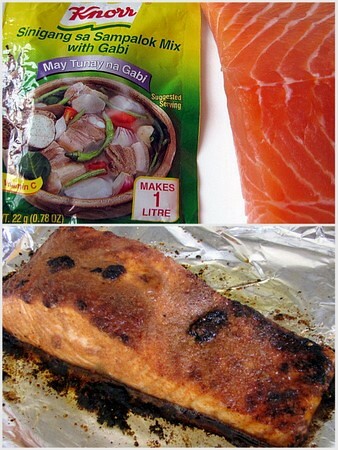 Who knew that a packet of sinigang mix powder would be perfect as seasoning for baked salmon fillet? Well, Yummy magazine did. Now you must be wondering why I'm not slurping hot sinigang soup, what with the terrible cold weather we have been having lately but I was really intrigued by the idea of using sinigang soup powder as a rub. I wasn't disappointed; the baked salmon fillet is tart, salty, and delicious. I steamed some camote (sweet potato) tops to complete the "sinigang" theme. Now that is a most unusual - but delicious - way of using sinigang mix! i have a sinigang mix without the gabi. would that work as well? Kayni, I think any sinigang mix will do. I was choosing between bayabas or this one. I'll try the guava sinigang mix next time around. Jay and Cherrie Pie, do try it. I would never think of using the mix as the spices. I can;t wait to try it.